This had looked like a good chase day for several days, and I looked forward to chasing once I got home from a meeting in the office, hopefully by 2:30. It was closer to 3 when I got home, and as I checked data it looked like the storms would be firing too far north, despite a warm front draped SE across Illinois from just northeast of the Quad Cities, and one or more outflow boundaries extending westward from across west-central Illinois to near the Iowa-Missouri border. Earlier storms in eastern Illinois had moved mostly into Indiana, and the only storms along the warm front were much farther north, in nrothern Iowa and Minnesota. Not wanting to drive 3 hours or more for a marginal chance of seeing something with little daylight left, I gave up around 3:30 on the idea of chasing, despite the RUC model's predictions of CAPE between 4000 and 5000 and decent helicity in west-central Illinois by 0:00Z. I did, however, continue to check weather every now and then as I continued working on a writing project. Suddenly, around 5:15, things started looking interesting. New storms began to fire along the warm front near Bloomington and to the SE, and it looked like something might also be firing farther west along the outflow boundary. Within minutes, SPC issued a red box for central IL, including areas as far south as the next county north, Macoupin. This was good enough for me - I would likely be able to get to potentially severe storms with less than 2 hours of driving, and have around an hour and a half of daylight to watch them. I quickly grabbed my gear, and was out the door and on the road by 5:35. I blasted north on I-55, watching in amazement as storms blew up all across the sky in front of me. The night before I had watched a storm chase video in which someone talked about how explosively storms could develop, going from clear sky to intense storms all over in a matter of minutes. This is what I was seeing as I headed north. Importantly, while the main line was NW-SE along the warm front, storms were also building westward along a roughly east-west line that looked to be just north of I-72 - undoubtedly one of the outflow boundaries I had analyzed at home earlier. Although I heard various SVR and TOR warnings for areas around Bloomington and to the east, and saw a spectacular backsheared, overshooting storm to my NE, I had decided well before I got to Springfield that I would blast west on I-72 (and angle north from there if necessary) to intercept the tail-end storm I could see off to my northwest. My thinking was that these storms would have the best inflow and would be the least likely to line out, being in an area where no other storms had occurred and good heating had. Also, this was the area progged by the RUC model to have the best instability, and good shear. Finally, I could get to these storms quickest (I thought), since their eastward movement would bring them toward me while the others would move away. By the time I got to I-72 and turned west, I could see the storms were still a ways north of I-72, so I headed north on 4 along the western fringes of Springfield to route 97, which goes WNW, then NNW (more or less) from the NW corner of Springfield. I turned west on route 123, finally getting to where I could see some RFB, but now the terrain turned hilly and wooded. 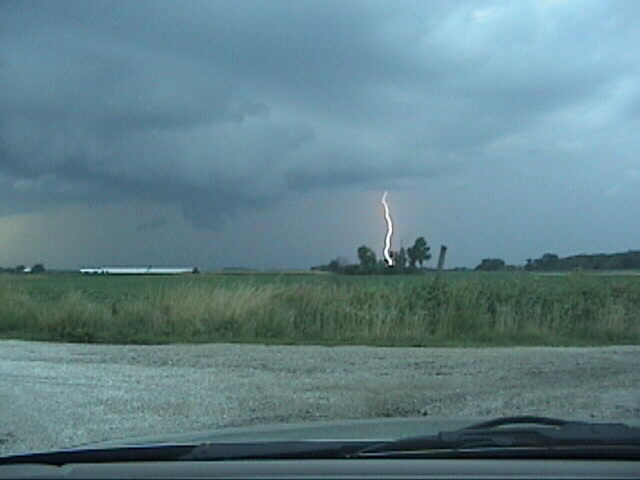 I found a clearing a couple miles east of Tallula and videotaped the very electrified storms for a while beginning around 7:10. What had been the tail-end storm no longer was, as another storm shot up a few miles to the west, a process that kept occurring for the next hour and a half. However, the westernmost storm would usually stay separate from the next one east. Most of the time I was on the second storm from the end of the line, but could also see the next one over. Repeatedly, the westernmost one would drift E or ENE, and another one would fire up where it had been. 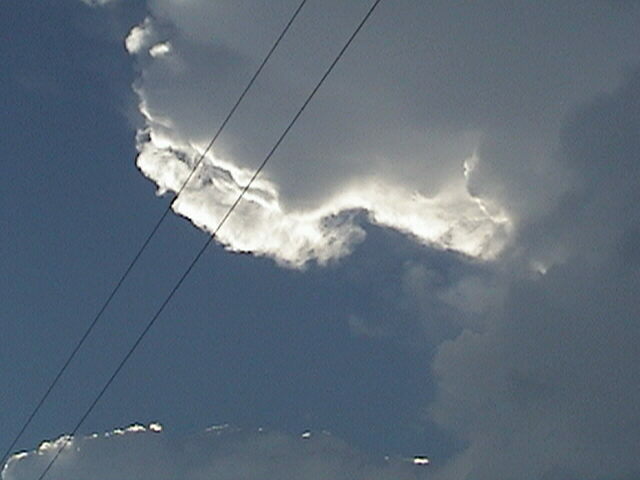 An example can be seen in this picture showing the knuckled, backsheard anvil of the storm closer to me and (at the lower left of the picture) the top of the glaciating tower of the new storm forming to the west. The storms were very nicely backlit, as it was near sunset and I was near the western end of the line of storms. Around this time, the Lincoln NWS office issued a SVR warning for Mason County based on the storms I was watching. However, the storms were still farther away than I wanted for a good view, so I worked my way north and west on the section roads, ending up on County Line Road which marks the boundary between Menard and Cass Counties. From a position roughly west (and maybe a little north) of Petersburg on County Line Road, I watched as the storm formed a non-rotating wall cloud, with scud rising from very near the ground just to the north of the wall cloud, like it was trying to form an inflow tail. 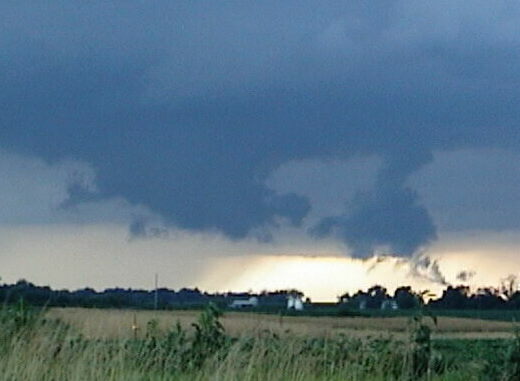 On the next storm to the west, farther away, I could also see this this scuddy lowering - both of these were visible at the same time. I watched the storms continue to produce lowerings like these for about a half hour, by which time I had moved north on County Line Rd. to a spot between 2 and 3 miles south of the Sangamon River. 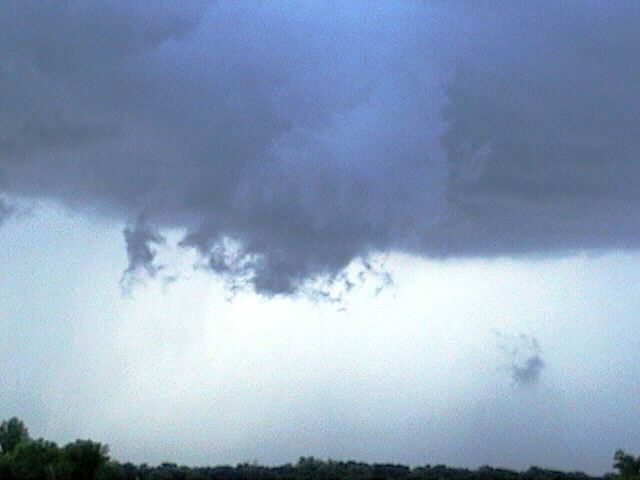 From there, I observed this impressive wall cloud to my NNE. The storm continued to be very electrified, producing lots of CGs like this one. As it backbuilt, the storm to my north and northeast in Mason County produced a wide lowering a little to my west under the updraft base that seemed to interact with new precip from a new cell to the west and increasingly looked like a shelf cloud. But as it moved away from the precip, it narrowed and took on more of a wall-cloud appearance, and around 8:00 p.m. it suddenly showed pronounced rotation. Although I did not hear it until a few minutes later, the NWS issued a TOR warning for Mason County at about exactly that time, based on radar indication of strong rotation near Kilbourne. 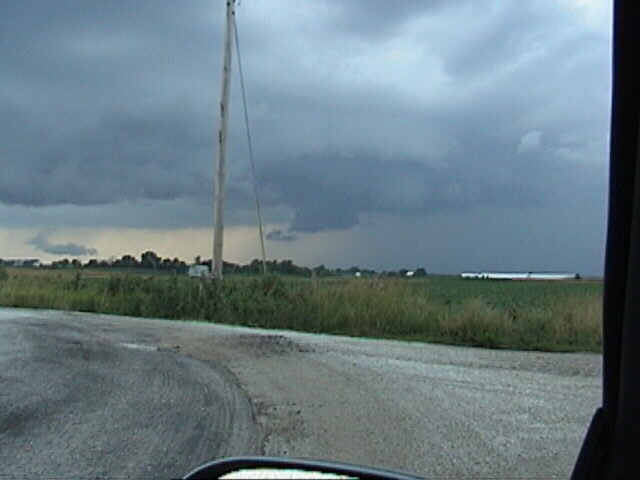 I was about 5-6 miles SSE of Kilbourne, watching the rotating wall cloud to my NW at the time this occurred. 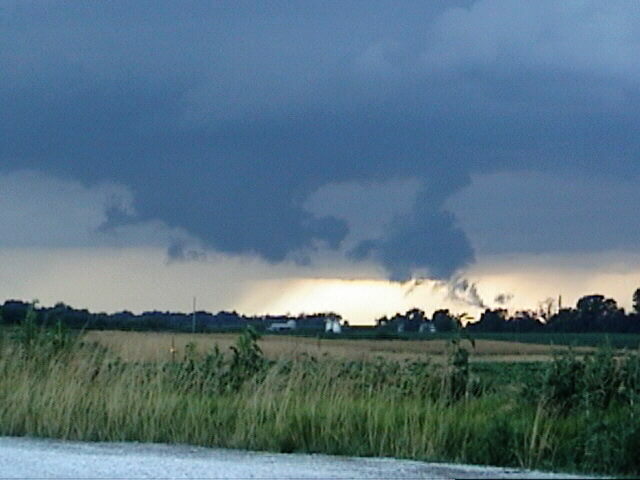 Here is a picture of the wall cloud during the time it was rotating. Unfortunately for my chase but fortunately for the people of Mason County, the rotation only lasted 2 or 3 minutes, and by another 10 minutes later, the wall cloud had dissipated. Around 8:20 I headed east on Bobtown Road, where another deer decided to run across in front of me - the third one I had seen during the active phase of the chase, and the second one that ran right across in front of me. When I got back to route 97 I decided to call it a chase and headed back SE toward Springfield. I did notice a new, wide area of lowered base to my NE, and around 8:40 an SVS indicated rotation was occuring in far eastern Mason County. 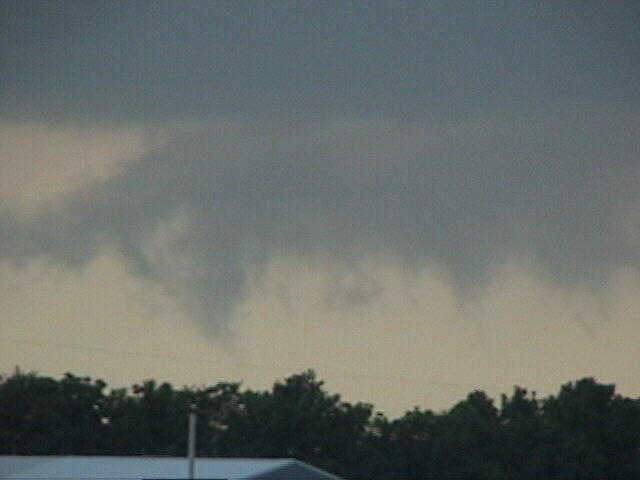 At the time I thought that the rotating wall cloud I was watching had occluded and a new one formed farther east. This may be true, but my later review of a radar loop showed two westward-moving outflow boundaries from the NW-SE alligned storms to the east. The rotating wall cloud and doppler-indicated rotation near Kilbourne occurred about when the first of these hit the updraft of the storm I was watching. Since the outflow boundary was moving west and the storm east, this may explain the brevity of the rotation. The outflow boundary, along with an inflow notch where the rotation was occurring, can be seen on this radar image from 8:00 p.m., just as the TOR warning was issued. The inverted white V just to the south of the storm over Mason County marks my location, on the county line of Cass and Menard Counties just south of the Sangamon River, which divides both of the latter counties from Mason County. The two outflow boundaries can be seen on this radar image, with the leading (westernmost) one just to right of and below the inverted V. The other one can be seen about one county to the east. The SVS that mentioned rotation farther east was issued around when the storm would have crossed the second outflow boundary, so I think these outflow boundaries may explain why the storm suddenly started to rotate but did not do so for long. Even so, this was a very enjoyable chase - the storms moved slowly and kept redeveloping in the same place, so they were very easy to chase - and very, very pretty to look at giving the good contrast and impressive structure. Interestingly, as shown in this LSR, these storms did not produce a lot of severe weather - one marginally severe hail report in Tazewell County being about it. However, they did produce considerable flash flooding, as seen in the LSR, and was warned for in this flash flood warning that was issued just before the tornado warning. This radar image showing cumulative precipitation tells a similar story, indicating 8 or more inches of rain in western Mason County, where the storms kept redeveloping in the same place. One note: All of the pictures in this chase report are digital video captures. Most are unaltered, but a couple of them are enhanced to improve contrast. As usual, comments are welcome, especially from anyone else who observed this storm. They may be sent to me at jfarley@siue.edu.